Amazing Kingsville Penthouse Triplex with Breathtaking Concession Views & Terraces (see the “s”)! Woooooh, what an awesome pad, still in awe…, got a take a moment. Ok, I’m exxagerating just… a little bit. Awesome it is though, it’s the Penthouse of the Kingsville Condo Building on Anfu Rd (the red one, with the arched entrance, right, literally right across Baker & Spice) near Wulumuqi Road. The Apartment occupies the top three floors of the Condominium, and has an entrance area with closet and shoe cabinet. Right to the north is the super modern semi-open western kitchen with all built in european appliances and loads of storage space. Further behind is the Laundry Room, Storage Maid’s Quarter and work balcony. The Living Room Lounge is spacious and open, with two floor high ceilings, and matching all window side for simply breathtaking views across the French Concession. The Formal Dining Room is to the East and spacious enough to feature a long table for 12 or even more people The Guest Bathroom behind is spacious and features a double sink. Next to is a guest bedroom with en-suite Bathroom. There also is a first floor, uhm, how to call that, guest Terrace for entertaining. On the second level are 2 en-suite Bedrooms, and one office overlooking the living room lounge, and partially sharing this amazing view and natural light. On the third level is the Master Bedroom with huge open bathroom featuring a tub, large walk in shower, two sinks and loads of storage as well as a huge 200 square meter Terrace all around. 5 Bedrooms, 4 and a half Bathrooms, 2 Living Rooms, Modern Open Kitchen, 2 Terraces. Wonderful French Concession Loft Apartment with huge rooftop Terrace! This beautiful apartment is located in the top floor of an hisotric french concession garden house. People’s 6 (both are literally across the street), and nearby restaurants as the Paulaner Brauhaus Garden, the La Creperie, the Camel, City Deli, Ambrosia and many more. The Apartment features a spacious and open living room with lot’s of sunlight from all directions. The flat also has super high ceilings, with exposed beams and charming historic wood. The open kitchen features a bar, and all appliances, including oven, microwave, lot’s of workspace, big pantry and dual door fridge. There is radiator heating throughout the place in all rooms for warm heat in the winters. Both rooms are spacious and bright, with double glazed windows and bathroom access. The best part of the apartment is the amazing, private rooftop terrace that is just huge! And it has great views over all of the french concession all the way to pudong or Hongqiao. Jing’an Penthouse Duplex with private all overlooking Terrace! This wonderful Penthouse Duplex is in the Manhattan Heights Compound on Xikang Road near Xinzha Road, a few minutes walk to the Portman Ritz Carlton, Shanghai Center, Plaza 66, City Center, Jing’an Temple and The Metro Line 7 and 2. The Penthouse is newly renovated, with a cool, modern style flair with emphasis on simplicity. It features a big living room, that connects dining, kitchen, and bathrooms together. It also has a big window site with grand views over the skyline from here. The Bedrooms and study are on the second level of the penthouse, with big spacious master bedroom that also has an en-suite bathroom with jacuzi, shower and a walk-in closet next to it. On the first level also is a study and a guest bedroom, which is right next to the 1st floor guest bath. The Modern Kitchen is simple and western, with good work space, and built in appliances and a laundry room with washing machine and dryer. The Guestbedroom is just as spacious and next to the guest bathroom. The 3rd Guestroom �could also be used as a study or media room and is across the other two bedrooms. Out the stairs is the huge private Terrace that is great for hosting barbecues or private parties. All in all a great place to entertain, with new renovation, and lot’s potential. 5 Bedrooms, 2 Living rooms, 3 Bathrooms and Laundry Room. Amazing Gubei Penthouse Triplex with huge Terrace! This beautiful Penthouse Triplex is in the most loved and popular location in Gubei right next to Gubei Carrefour on Huang Jin Cheng Dao. The Apartment occupies the top three floors of a modern apartment building from the 18th Floor. It’s recently renovated, with only top of the line finishes throughout, with a open, modern western kitchen in the main room with formal dining and living room lounge directly connected. The Kitchen also features an oven, a built in bar and lot’s of custom cabinet space. Floor to ceiling windows throughout the place let endless sunlight flow through the place and with views over the whole of gubei and hongqiao all the way to the downtown area �and pudong coming through. There are three bedrooms, with two en-suite featuring ultramodern bathrooms and the master offering a huge tub as well as a walk in shower. There also is an open office and a 2nd lounge on the top level leading out to the… wait for it… rooftop terrace with green garden, trees and grapetree sitting and relaxation area. Call Oliver at 15900987878 to find out more. 3 Bedrooms, 2 Living rooms, 4 Bathrooms, walk in closet and more. Unique Chanter Garden Duplex with tasteful, modern interior! This beautiful duplex apartment is in the exclusive french concession residence at Chanter Garden on Hunan Road and Xingguo Road. The Chanter Garden has long been one of Shanghai’s most desired addresses, with small buildings, a great management and few spacious units in a private, quiet area of the French Concession. with elegant, designer furniture and renovation. Entered through a private elevator, the place first features a spacious reception area, with big, built in closet and lot’s of shoe shelves. Through, the wide, tall open living room entrance, one immediately feels the�openness�and welcome feeling of the apartment. It’s high ceilings, lot’s of sunlight, and large open space are truly unique. The Living room lounge features a large artistic wall side, and two storey full sized windows (with glass doors opening to the balcony) that overlook the charming, green garden area. The Kitchen is super modern, spacious, with lot’s of custom cabinet and storage space, dishwasher, oven, microwave, ultramodern two door refridgerator and with big storage room in the back. Sliding doors divide the study from the designated dining room area and lounge, it’s well furnished and features a tatami style guest bed. There are plenty of shelves for decorative items and books. The Guest Bathroom is modern, elegant, and clean, with simple lines and cuts. Up the stairs is a second lounge area and then three bedrooms on the same floor. The Master Bedroom is connected with another guest bedroom that could also be a perfect babyroom (connected to the master bedroom) or study. It features a modern walk in closet and an en-suite bathroom with huge tub, and spacious walk in shower. The Guest Bedroom is just as elegant and also right next to the guest bath. 4 Bedrooms, 2 Living Rooms, Dining Room, Storage, Reception area, 410 square meters. Hunan Road and Xingguo Road in the French Concession. Asking 65000 Rmb, including Club Membership at the Radisson (less than 5 minutes walk), Taxes and Management Fee’s. Call Oliver at �15900987878 or Jimmy at 13818232004. Fantastic French Quarter Penthouse with top finishes & Terrace! This beautiful Penthouse Duplex is located on Fuxing Rd near Xiangyang Rd in the Mingyuan Century Garden top floors. The Flat features only top of the line finishes throughout with imported materials and equippement as well as a state of the art security system. 4 Bedrooms, 3 Living rooms and 3 Baths are spread out over 271 square meters of quality. The Duplex has a super spacious�living room�with gorgeous views over the former french concession through the huge floor-to-ceiling windows. There is lot’s of indirect light and the lounge and designated dining room area make a big open space together. It also features an electric fireplace heater for cozy warmth during the shanghai winter! The Master Bedroom features a big en-suite bathroom with shower and lot’s of storage space, the walk in shower is huge and the whole style of the bathroom is modern and western. The other bedrooms are also spacious and feature lot’s of built in storage. The Kitchen of the apartment has a wonderful stone countertop that is a quality import and very smooth. There is lot’s of custom cabinet space and it features lighting inside and built in appliances. The Apartment also has an entrance with lot’s of closet space and mirror. The location is in proximity to lot’s of trendy bars and cafe’s (such as the popular creative cafe YY on Nanchang Rd, the blue chair and many more), the metro is walking distance and there are lot’s of gems to be discovered in the nearby area through all these charming french concession lanes! Fantastic Xujiahui Penthouse Duplex with private Terrace! A wonderful Penthouse Duplex in the popular Fountain Garden Compound in Xujiahui at Nandan Road near Tian Yao Qiao Road. The Flat is spacious, has 3 Bedrooms, 1 Study, 2 Living Rooms, stretches 2 storey’s and features 3 full baths and a huge private terrace with built in glass-lounge area. The 30th F terrace also features an amazing view over Shanghai’s commercial Xujiahui District to the Shanghai indoor stadium and even further. The Living Room is super spacious, with simple white marble floors that reflect the light falling in through the floor-to-ceiling (double paned) Panorama-view windows. There also is a lot of indirect lighting all throughout the apartment. The equal sized (big) bedrooms all have nice views over the xujiahui towers and compound to the shanghai stadium roof further south. Sunlight comes in naturally during most of the day from the morning to late afternoon. The Study is in the first floor but just as sapacious as the rooms and already set up with wireless and highspeed internet. The Kitchen is very light, roomy with lot’s of workspace and bright. It also enjoys a view to the Xujiahui North side where the famous Grand Gateway Towers (visible) stand. The Bathroom’s are all very elegant, spacious and in an modern-oriental style. The Terrace is about 100sqm big, has lighting all around and is a great outdoor space to have some friends over for the 2010 football worldcup or a simply hang out. Fountain Garden is a newer developement in Shanghai’s Xujiahui Commercial Area (Microsoft, Swatch, Yum, Mitsubishi, Intel and many other multinationals choose this as their shanghai home), right across the street from the popular italian spot “saizeria cafe”, Starbucks, Yamamoto, and lot’s of Shops. Through the back gate within 1 minute walk is the Novel City Shopping area with Blue Frog, Paris Baguette and City Shop. 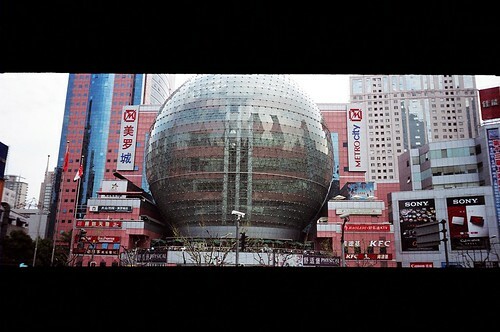 The Metro City Mall (big glass ball) which houses even more Restaurants, Cafe’s (couple of more starbucks’) and is as well one shanghai’s famous electronic mall. The Compound features security 24 hours and is modern and well built with good insulation and strong double glazed windows. It’s Garden’s are wonderfully done, idyllic, with small lakes and bridges. There also is an all famous Shanghai Alexander Yoga Clubhouse with indoor swimming pool and spa here. Asking 23000 Rmb per month.